The commander of The Falcons is Aloni Tev. Aloni is a Terran and also a survivor of the Dropsite massacre. He is described as dark in complexion with a narrowness and slant to his eyes. He has a shaved head with many gilded service studs riveted into his scalp. He was deployed on a jetbike during the Dropsite Massacre. The obvious build to run Aloni as a praetor with paragon blade or raven talons. I could run him as a delegatus as well... 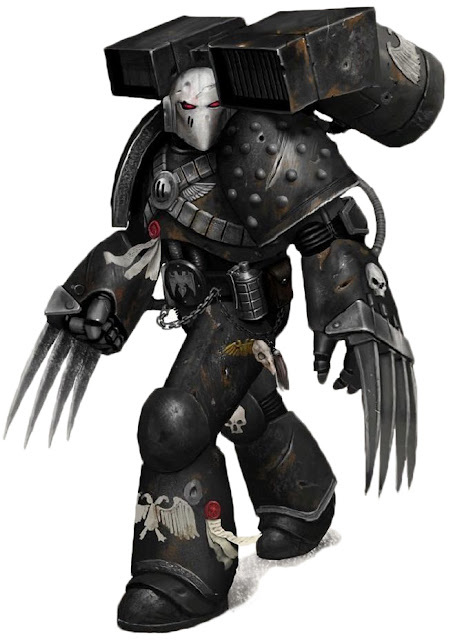 I'm tempted to do a conversion off the Sammael Raven Wing model for a jet bike option, but for this army I will put him in a jump pack. My current thoughts are to use a Blood Angel's model. To represent a Falcon's fighting force, I will be building a Jump Assault list that relies on mass jump infantry. The idea is to field an army that looks awesome, and is fun to play and play against. My initial idea is to field a list that hit hard and then faded away. With that in mind, I will be putting something together that will use the Angel's Wrath ROW. I want to use pure jumpers. From a META perspective, it basically wastes the point my opponent spent on tank hunting by not offering any tank targets and I think it will just looked awesome. House Rule 2: Raven Guard Jump Infantry do not gain Infiltrate & Fleet. Ignore the BBB rules that Jump infantry are Infantry and should get ALL infantry rules. Here are a couple versions of the list. Obviously there are lots of options in lists. The first 2 are more "Everyone gets a melta bomb attack" centric. The idea is to overwhelm with bodies and be in hth either turn 1 or 2. At the end of their turn, you hit and run to gain movement and also the bonuses from charging again. So the chaplains are REALLY important, because they give you fearless from zealot. So you are a tarpit controlling the board. It's also nice that they give you re rolls to hit and fear, but the boarding shield also reduces damage from units counter charging you. I'm still on the fence about combat shields, but I think I will start using them more when I drop the melta bombs out of the list. Dark Fury pretty much kill everything. They really are an amazing blender unit, especially with hit and run. You also have the option of bouncing a chaplain into a dark fury unit to give re rolls to hit. Although, that is almost always over kill, and overkill is actually a big issue with this list. I find myself spreading out units, trying not to hit with too many guys to totally kill a unit, so they aren't standing around in the open holding their dicks in your opponents shooting phase. It's hard to find way to make it fit, but rad grenades are THE BOMB. Forgelords are probably the easiest way to incorporate them. The forgelord is actually best on a jetbike with a grav gun and rad grenade. That said, if you run him with the jump pack you get hit and run. Other options are Mortitats and Destroyers, but without infiltrate it's hard to fit these guys in. If you aren't allowed to infiltrate, it's not a bad option to give a unit a nudge towards the enemy. To Corax Or Not To Corax... That is the question... This is the sort of list you would want to Run him in. Other than being a pretty versitile beat stick, he does give everyone a 6" run. Pretty much guarantees you a turn one or two charge. I've often weighing 10 Dark Fury and a Chappy in the list vs the primarch. Yes. 3 fire raptors seems to fit great in this list! Although, after trying it a couple times, the timing is off. You need bodies on the board to get into hth and by turn 2, you already have a pretty good idea of how the game is going to go. For the Angel's Wrath ROW, Speeders & jetbikes are basically your only option for tank hunting that starts on the board. They are also one of those options that are smashing opponent units turn 1 and your opponent is put in the unenviable position of having to decide if they protect their tanks or let your jump infantry get across the board unscathed. Dreads in anvillus pods offer a similar conundrum. As for Jetbikes, I just don't think they have the right long range weapons to truly be successful. I'll be playing a couple of these list to get a feel for them. I will also be posting my progress as I build out this army. LMK what list you guys like or if you have any suggestions! I agree with your assessment that Jump Infantry are Infantry, but Luke is right that Artificer and Jump Packs are mutually exclusive. Have I missed an FAQ or have you miscalculated the points of the units of Dark Furies? 175 base + 5 additional at 30 per model to me equals 325, no? Also still not found these rules where jump infantry gain all infantry rules ! Infiltrate and fleet would be sweet as ! MF'r Yeah. My list building software is off! Damn... That's a lot of point to fix. Looks like, it's goign to be less Apothecaries. I'll update. "Unlike most other unit type categories, 'Jump' is not a classification in and of itself. Instead, you'll find it occurs before another category- commonly Infantry... ...Jump units therefor share two sets of rules, the Jump unit rules, those of their base type. Jump infantry would, for example, follow the rules for Jump units and Infantry." Pg 65 first paragraph starting on the second sentence. "The Rules"
It literally says 'Jump' is not a category... So follow the rules for both jump and infantry. It could not possibly be more clear. FW might be retarded and wrote the rule wrong, but that's what FAQs are for and we have had like 3 FAQs and a reprint of the Rules. And YES they know about the issue. So I say play by the RULES. Can you have a boarding shield and jump pack ? Yes. Why wouldn't you be able too?